How important is back story when selling a piece of art? It’s everything — even if that story is a tale of disaster. 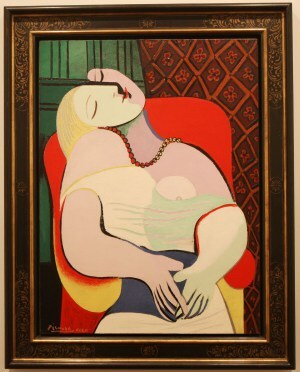 In 2006, casino owner Steve Wynn was about to sell “La Rêve”, a 1932 painting by Picasso, to collector Steven Cohen for $139 million. But shortly before the sale, while showing off the painting to dinner guests, Wynn accidentally put an elbow right through the canvas. Cohen backed out. It took eight weeks for a New York City-based ­restorer to repair the work, at a cost of more than $90,000. Wynn took his insurer, Lloyd’s of London, to court, arguing the modified painting was now worth only $85 million. Lloyd’s settled for $39 million. Gossip columns chronicled the misfortune — perversely adding value to the Picasso, and in March 2013, Cohen came back to buy it. The price? $150 million — $11 million more than before. (courtesy of Maureen Callahan – NY Post). Take a look at our beautiful Picasso collection here.